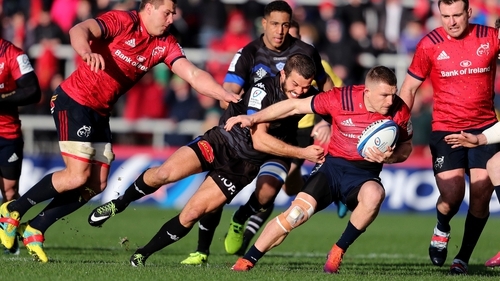 Can Munster win in Castres after beating the same opponents 30-5 last week? Last week was Ulster's best performance of the season. They really played well over in Parc Y Scarlets and to come away with a four-try bonus was a huge win. Ulster's problems in the last two or three years have revolved around a total lack of consistency in their performance. So I'm expecting them to back that up tonight. The experienced guys like Rory Best and Iain Henderson all played really well last week but it was the younger guys: Eric O'Sullivan in the front row and Will Addison were outstanding. They have to win it to try and keep pace with Racing but if they play as well as they did last week it could be one of those special nights in Kingspan Stadium. I expect Ulster to win. Leinster showed incredible character and resilience last week in Bath. When you're the champions, when you have so many players who feature for Ireland against New Zealand, that tends to focus the opposition's minds. Bath raised their game, almost in fear that if they didn't turn up they were going to be on the end of a hiding. Leinster had to fight hard to win but I think they'll be better for that game. A lot of the internationals hadn't played a match since the All Blacks and I expect Leinster will win. A try bonus would be important: Toulouse are leading the group and are at home to Wasps, which you would expect them to win. It's an incredibly difficult place to go. You go back to the game last Sunday in Thomond Park, I thought Castres were absolutely awful. They showed no ambition whatsoever and when you consider they are the reigning Top 14 champions, they were abject in the way they approached that game. Munster weren't at their best but they survived the loss of Joey Carbery and Chris Farrell just before kick-off. They didn't get the four-try bonus, which left a slight bit of disappointment around the game but this is going to be a totally different match. To put it into context, Leinster went to Castres two years ago and were lucky to come away with a draw. Munster snuck a draw a there last year. So I think it's going to be very tight, a one-score game. It would be an outstanding result if Munster could pip them. As a minumum, they'll need a losing bonus point but if they can up the performance a bit from last week they can win it. We'll just have to wait and see what team Castres announce but I think it's going to be the tightest game of the weekend.